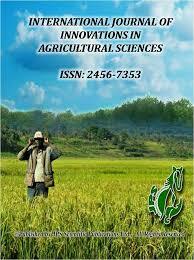 International Journal of Innovations in Agricultural Sciences (IJIAS) is a bimonthly international Agriculture research journal (Six issues per year) of “JPS Scientific Publications” which publishes original research articles, review papers, short communication papers and case reports relevant to various agriculture fields such as Agribusiness, Agricultural Chemistry, Agricultural Economics, Agricultural Engineering, Agricultural Extension, Agricultural Genomics, Agricultural Microbiology, Agricultural Physics, Agriculture and Rural Management, Agronomy, Animal Biotechnology, Animal Genetics, Animal Husbandry, Animal Nutrition, Animal science, Aquaculture, Arid soil research and rehabilitation, Climatology, Crop Physiology, Crop science, Dairy science, Entomology, Environmental Science, Farm Management, Fish & fisheries, Floriculture & Landscaping, Food Science & Technology, Forestry, Freshwater Science, Fruits & Horticulture, Horticulture, Irrigation , Nematology, Pesticide science, Plant Breeding & Genetics, Plant Physiology, Plant Protection, Plant Pathology, Post Harvest Technology, Poultry science, Seed science research, Sericulture, Soil Science, Stored products research, Systematic biology, Tree fruit production, Vegetable Science, Veterinary, Veterinary Microbiology, Veterinary Public Health, Veterinary Surgery, Water resources management, Weed biology and any other areas related to Agricultural Sciences. The open access policy of the journal makes the articles freely accessible online immediately upon publication such that the journal can reach a broad spectrum of readership. The ultimate goal of the journal is to take lead in publication of outstanding research papers in agricultural science and technology with the publication of the advanced and latest findings to promote further research in these areas. IJIAS welcomes the submission of manuscripts that meets the general criteria of significance and scientific excellence. Electronic submission of manuscript (in a single MS word file) is strongly encouraged. All manuscripts are subject to rapid peer review and high quality manuscripts will be published. A style manual comprising pertinent information for authors is given here. Kindly consult this for maintaining consistency in presentation. Your manuscript should be submitted in clear and readable English. Your work should conform to high editorial standards and consistency in style. In order to ensure high quality, we prefer that your final draft is reviewed. You may acknowledge the reviewer in your chapter. Please provide your manuscript electronically in MS Word 2007. The text must be in single space (Line space - 1). Font: Times Roman (size 12 points). Page number should be in the centre at the bottom of the page. Use standard abbreviations and avoid nonstandard abbreviations. Use hr for hour, min for minute, sec for seconds, yr for year, mon for month, wk for week, d for day. Do not add ‘s’ to create plural. (E.g., 6 yr, 4 mon). Use ‘Fig.’ if singular and ‘Figs.’ for plural. (e.g., Fig. 8; Figs. 9 and 10). Do not abbreviate names of months in the text. Do not abbreviate the Genus and Species names. Genus and species names, et al., in situ, in vitro & in vivo should be in italics font. The text should be in third person only. If the authors/editors prefer, they may use first person. However, which narrative style is decided upon should be used consistently throughout the book. Use double quotation marks “ ….. ” for quoted information only. Only International System (SI) units should be used for all measurements. Use the symbol % only with numerals in tables and figures. Do not leave space between the number and the symbol %. In the text use the word percentage (e.g., percentage of infestation). Use ‘per’ rather than slash unless reporting measurements in unit to unit. (e.g., arthropods per gall and not arthropods/gall; mg/mm2 and not mg per mm2. The Title must be brief, clear, comprehensive and descriptive. Title should be of 14 pt bold uppercase. Title should include the study theme with no abbreviations allowed. Each authors must provide their Full name, Institution name, Institutional address, E.mail address and Phone number. The Corresponding author of the manuscript to whom the correspondence is to be send must be marked with an asterisk*. It is the sole responsibility of the Corresponding author to ensure that all co-authors are aware and have approved each and every part/content of the submitted manuscript. Abstract should start on a new page after the Title page. The Abstract must not more than 250 words. Abstract should be informative and completely self – explamatory. Abstract should be as single paragraph. Please do not cite references in the Abstract. All the four cateogories (Original research articles, Review articles, Short communications & Case reports) must have an Abstract. Minimum 4 key words and maximum 7 key words are to be provided by the authors. The key words should by typed at the end of the Abstract on the same page. The Introduction part should provide a clear statement of the problems, relevant literature on the subject and the proposed approach or solution. Introduction must be clear and concise. Authors should state the reasons for carrying out the research work, background of the study and the hypothesis. Introduction should be understandable to colleagues from a broad range of research disciplines and should include up to date references. Material and Methods should be written in past tense and include sufficient technical information to allow the experiments to be performed. Only truly novel procedures should be described in detail; earlier published procedures should be cited, and significant changes of published procedures should be mentioned briefly. Information on the equipment model, manufacturers name and address including the city, province/state and country should be provided. Capitalize trade names and include the manufacturer's name and address. The use of sub-headings with numbers to divide the text is encouraged. In case of animal experiments authors must give the details of ethical approval. Methods in general use need not be described in detail. The Results and Discussion may be combined into a single section or presented separately. Results and their significance should be presented clearly and concisely, preferably in the form of graphs or tables which should be self explanatory. The reproducibility and statistical significance of measurements, material or biological data, must be included where relevant. The Discussion should provide an interpretation of the results and their significance with regard to previously published work. Discussion should relate the results to current understanding of the scientific problems being investigated in the field. There should not be any significant repetition of the experimental procedures or reiteration of the introduction. Tables should be submitted as MS-word, not as PDF or embedded image or any other forms. Tables should be placed at the appropriate places. Tables should be selfexplanatory without reference to the text. Title for the tables is must and it should be in bold face letters. Tables should be numbered consecutively in Arabic numericals (Table - 1, Table – 2, etc) and each Tables must start on a separate page at the end of the manuscript. Any footnote should be typed at the bottom of the table in italic. The same data should not be presented in both table and graph form. All figures including photographs should be numbered consecutively in Arabic numerals (Figure – a, Figure – 2, etc). Figures bear a brief title in lower case bold face letters below the figure. Figures should be prepared using applications capable of generating high resolution GIF, TIFF, JPEG or Powerpoint before pasting in the Microsoft Word manuscript file. Manuscript should have relevant brief conclusion and should reflect the importance and future scope. The main conclusions of the experimental work should be presented. The contribution of the work to the scientific community and its economic implications should be emphasized. In this section, the authors may wish to thank some research institutions, funding agencies, companies, or governmental bodies, grants or people who have contributed or financially supported the research from which the manuscript is derived. Cite only those articles published or formally accepted for publication. Check and include all the references mentioned in the text. Include adequate information to enable the reader to access cited materials (e.g., citations of books and conference proceedings must include name and location [city and state or country of the publisher]. Sournia, A. (1974). Circadian periodicities in natural populations of marine phytoplankton. Advances in Marine Biology, 12(2): 325 - 389. Smayda, T. J. (1997a). What is a bloom? A commentary. Limnology and Oceanography, 42(5): 1132-1136. Smayda, T. J. (1997b). Harmful algal blooms: their ecophysiology and general relevance to phytoplankton blooms in the sea. Limnology and Oceanography, 42(5): 1137-1153. Veldhuis, M. J and W. Admiral. (1985). Transfer of photosynthetic products in gelatinous colonies of Phaeocystis pouchetti (Haptophyceae) and its effect on measurement of excretion rate. Marine Ecology Progress Series, 26(2): 301 - 304. Johannsen, M., U. Gneveckow, K. Taymoorian, B. Thiesen, N. Waldofner, R. Scholz, K. Jung, A. Jordan, P. Wust and S.A. Loening. (2007). Morbidity and quality of life during thermotherapy using magnetic nanoparticles in locally recurrent prostate cancer: results of a prospective phase I trial. International Journal of Hyperthermia, 23(2): 315 – 323. Lin, T.H., H.C. Kuo, F.P. Chou and F.J. Lu. (2008). Berberine enhances inhibition of glioma tumor cell migration and invasiveness mediated by arsenic trioxide. BMC Cancer, 8(1): 5 - 8. Boucher, P. (2008). Nanotechnology - Legal Aspects. CRC Press, Boca Raton, Florida. Kim, D and Y. H. Bae. (2009). Polymeric carriers for anticancer drugs. pp. 207–243. In: Y. Lu and R.I. Mahato (eds.). Pharmaceutical Perspectives of Cancer Therapeutics. Springer, New York. Cherukuri, P., C. J. Gannon, T. K. Leeuw, H. K. Schmidt, R. E. Smalley, S. A. Curley and R. B. Weisman. (2006). Mammalian pharmacokinetics of carbon nanotubes using intrinsic near-infrared fluorescence. Proceedings in National Academy of Science, USA, 103: 18882 – 18886. Swanson, M. (1997). Estuarine measurements of chlorophyll fluorescence with high temporal resolution. M.S. Thesis, University of Rhode Island, Narragansett, Rhode Island. Onyuksel, H and I. Rubinstein. (2001). Materials and methods for making improved micelle compositions. U.S. Patent # 6, 217, 886.
Review articles should not be more than 30 pages and contain comprehensive coverage of relevant literature. Review articles should preferably be written by researchers who have in-depth knowledge of the topic. Review articles need not to be divided into sections such as Materials and methods, and Results and discussion, but should definitely have an abstract and introduction. The Short Communication is suitable for new models, innovative methods and techniques. It is similar to original research papers, but with limited data. The research and technical communications section of this journal (maximum 3,000 words) is open to interesting results worthy of publication without requiring extensive introduction and discussion. This section should be organized as follows: Abstract, Introduction, Materials and methods, Results and discussion (combined). Not more than 10 references should be provided. Tables, figures and references are to be arranged in the same way as for research papers. All articles are reviewed by an editor and members of the Editorial Board or capable external reviewers. Decisions will be made as quickly as possible, and the journal try hard to return reviewers’ evaluations/comments to authors within two weeks. Submission of the manuscript represent that the manuscript has not been published previously and is not considered for publication elsewhere. Authors would be required to sign a CTA form (Copy Right Transfer Agreement) once the manuscript is accepted which would be sent to the corresponding author’s email. The corresponding author can download the form and after getting authors and co-authors signature it can be send as an attachment file after scanning to the journal or by E.mail/Post/Courier along with the publication charges. All manuscripts should be submitted via E.mail to jpsscientificpublications@gmail.com as an attachment for quick evaluation. Electronic proofs will be sent (E.mail attachment) to the corresponding author as a PDF file and returned within 3 days. Page proofs are considered to be the final version of the article. With the exception of typographical errors, no changes will be made in the manuscript at the proof stage. All the articles will be published liberally online to attract a wide audience), authors will have free electronic access to the full text (PDF) of the article. Authors can freely download the PDF file from which they can print unlimited copies of their articles. Accepted articles will be published online for free open access for all to view. Open access publishing provides the maximum dissemination of the article to the largest audience. Corresponding authors will be asked to pay their publication charges as open access fee per published article which allows indefinite free-to-view online publication with IJIAS. For more informations contact us at jpsscientificpublications@gmail.com. Dr. P. Sivasakthivelan, Department of Agricultural Microbiology, Faculty of Agriculture, Annamalai University, Annamalai Nagar, Tamil Nadu, India. Dr. P. Saranraj, Department of Microbiology, Sacred Heart College (Autonomous), Tirupattur, Tamil Nadu, India. Dr. Jabbar T. A. Al - Ali, College of Health and Medical Technology, Southern Technical University, Basra, Iraq. Dr. Ramesh C. Ray, Principal Scientist, ICAR – Central Tuber Crops Research Institute, Dumdum, Bhubaneswar, Odisha, India. Dr. Mario Bernardo Filho, Laboratory of Chemical and Biological Analysis (LAQB), Foundation State University, Centre of West Zone (UEZO), Rio de Jeneiro, Brazil. Dr. K. Srinivasan, Department of Food Science, University of Pretoria, South Africa. Dr. Jiban Shrestha, Scientist (Plant Breeding and Genetics), Nepal Agricultural Research Council, Nepal. Dr. Mohammad Mozammel Hoq, Department of Microbiology, University of Dhaka, Dhaka, Bangladesh. Dr. T. Raj Pravin, Department of Agricultural Extension, Faculty of Agriculture, Annamalai University, Annamalai Nagar, Tamil Nadu, India. Mr. N. K. Shanmugavelu, Deputy Director of Agriculture, Government of Pudhucherry, India. Dr. Manohar Murugan, Department of Microbiology, Sebha Universiry, Sebha, Libya. Dr. S. Babu, Department of Agronomy, Faculty of Agriculture, Annamalai University, Annamalai Nagar, Tamil Nadu, India. Dr. Nabil Qaid Alwossabi, Department of Food Science and Technology, School of Food Science and Technology, Jiangnan University, China. Dr. Glaucio Dire Feliciano, Laboratory of Chemical and Biological Analysis (LAQB), Foundation State University, Centre of West Zone (UEZO), Rio de Jeneiro, Brazil. Dr. Ishan Phukan, Senior Scientist, Soil Department, Tocklai Tea Research Institute, Jorhat, Assam, India. Dr. Sattar Rashid Suhail Alakabi, College of Veterinary Medicine, Wasit University, Iraq. Dr. A. Jayaprakash, Department of Biochemistry, Sacred Heart College (Autonomous), Tirupattur, Tamil Nadu, India. Dr. Ammar Mohammed AL-Ferga, Department of Food Science and Technology, School of Food Science and Technology, Jiangnan University, Wuxi, China. Dr. Nihad Abdulateef Ali Alnidawi, Animal Production Department, Agriculture College, University of AL - Qasim Green, Iraq. Dr. Masoud Haghighi, Coldwater Fishes Research Centre (CFRC), Tonekabon, Iran. Dr. K. Arivukkarasu, Department of Agronomy, Faculty of Agriculture, Annamalai University, Annamalai Nagar, Tamil Nadu, India. Dr. Mustafa Salah Hasan, College of Veterinary Medicine, University of Fallujah, Iraq. Dr. V. Prabudoss, Department of Agricultural Microbiology, Faculty of Agriculture, Annamalai University, Annamalai Nagar, Tamil Nadu, India. Dr. J. Padma, Agricultural Officer, Government Soil Testing Laboratory, Tiruvannanmalai, Tamil Nadu, India. Dr. Abdalbari A. Alfaris, Department of Surgery and Obstetric, College of Veterinary Medicine, University of Basrah, Basrah, Iraq. Dr. P. Ganesh, Division of Microbiology, Faculty of Science, Annamalai University, Annamalai Nagar, Tamil Nadu, India. Dr. Javier Velasco Sarabia, National Institute of Fishing and Aquaculture, Mexico. Dr. T. Umamaheswari, Department of Horticulture, Faculty of Agriculture, Annamalai University, Annamalai Nagar, Tamil Nadu, India. Dr. J. Sherly, Department of Horticulture, PAJANCOA & RI, Karaikal, India. Dr. Mazher Sultana, Unit of Human Health and Environmental Biotechnology, Department of Advanced Zoology and Biotechnology, Presidency College, Chennai, Tamil Nadu, India. Dr. R. Amutha, Department of Microbiology, Vivekanandha College of Arts and Science for Women, Tiruchengode, Tamil Nadu, India. Dr. R. Durgadevi, Department of Foods and Nutrition, D.K.M College for Women (Autonomous), Vellore, Tamil Nadu, India. Dr. R. Elaiyaraja, Department of Microbiology, Shanmuga Industries Arts and Science College, Tiruvannamalai, Tamil Nadu, India. Dr. M. A. Farook, Department of Biotechnology,Islamaiah College (Autonomous), Vaniyambadi, Tamil Nadu, India. Dr. R. Suresh Kumar, Department of Microbiology, Vysya College, Salem, Tamil Nadu, India. Dr. S. Anbu, Department of Biochemistry, Sacred Heart College (Autonomous), Tirupattur, Tamil Nadu, India. Dr. M. Jeganathan, Designed Environment Academy and Research Institute, Trichy, Tamil Nadu, India. Dr. B. Shiney Ramya, Department of Microbiology, Shree Rhagavendra Arts and Science College, Keezhamoongiladi, Tamil Nad, India. Eminent editors from throughout the world. Paper acceptance/comments/rejection within one week. High quality and rapid publication servie with precise review process. Journal indexed in different reputed publishers databases. Frequent communication with authors to know their manuscript status. Authors retain the copyright to their works. Award for Best Research and Best Review papers. Dr. J. P. Saranraj M.Sc., M.Phil., Ph.D.